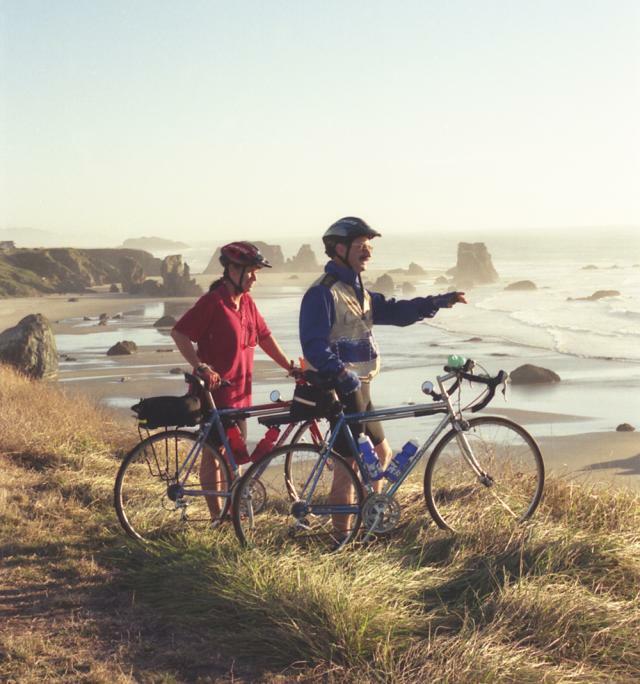 PHOTO CAPTION:Bicyclists take in the inspiring view at Coquille Point in Bandon. This was one of the stops on a proposed bicycle tour for South Coast towns. The route wasn't selected, but bicyclists can still enjoy it and the other rides. In a project by Oregon's travel and tourism agency, South Coast communities from Bandon to Brookings were invited to submit a route that could be added to the state's roster of designated scenic bicycle tours. I'll discuss the winner in a moment, but elements of the other proposals are worth a mention. Among the bikeway criteria was to minimize riding on already-overtaxed main highways, which in our case meant US 101. Also, US 101 is already designated as the Oregon Coast Bike Route, and gets more than enough bicyclists in the summer months. But since US 101 is the Oregon coast's "main street, it's difficult to completely avoid. Hence most routes have short segments on 101. In Bandon, for example, the proposed tour took in Beach Loop Drive with its many awe-inspiring ocean vistas. Then at the southern end of Beach Loop bicycles would ride south along US 101 for a couple of blocks before turning on Rosa Road, and looping back to town. From there, riders could make their way north on US 101, crossing Bullards Bridge -- probably the least fun part of the tour – then up and back peaceful North Bank Lane. Gold Beach's proposal involved back roads to Nesika Beach and beyond, while the proposed Brookings route involved a ride up Chetco River Rd., among other things. By the powers of deduction you've probably figured out that Port Orford won, with a route that begins in town, heads north to ride up and back on Elk River Rd., then another short US 101 stint up to Cape Blanco State Park, and out to the tip of the cape and back. On their return, bikers can detour to Paradise Point State Park before heading back to town on side roads paralleling US 101. All in all, the route fulfilled many of the specifications for the designation, and so it's joined the ranks of similar tours all over Oregon. The state's Travel Oregon website has maps and details of all of them. Other than discreet signs at a few intersections, there aren't any special indications of the bike route, and there's no other infrastructure involved, with already-existing restrooms and facilities at Battle Rock, Cape Blanco and the other parks and campgrounds. From Battle Rock, go north on US 101 one block and turn right on Jackson St. Follow it just under 1 mile to where it ends at 25th St., and turn left. In a few feet, turn right (N) on Port Orford Loop and follow it to US 101. Turn right (N) on US 101. It climbs gradually. In a bit over 1 mile, turn right (E) on Elk River Rd. The road swoops down through the coastal plain, passing homes, a mobile home park, a power substation and some mighty walls of gorse. The river isn't visible until you near the state fish hatchery about 7.5 miles upriver. You can stop for a look at the fish, and there's a restroom and picnic table. The Rogue River-Siskiyou National Forest boundary is just beyond, with the road threading through the narrowing river canyon. The magnificent Elk River is a treat in every season. Pavement ends 19 miles up at USFS Butler Bar campground, with restrooms, picnic tables and campsites. When you're ready to head back, you can enjoy the picturesque ride all over again. Once back on US 101, turn right (N) and in 1.1 miles turn left (W) to Cape Blanco State Park. The road drops down to the coastal plain, enters the state park, passes historic Hughes House and eventually arrives at road's end near Cape Blanco Lighthouse. Retrace your way back to US 101 and turn right (S) to return to Port Orford. To visit Paradise Point State Park, in a couple of miles turn right (W) on Paradise Pt. Rd. and follow it to road's end. You can then continue returning to town either on US 101 or adjacent frontage roads.